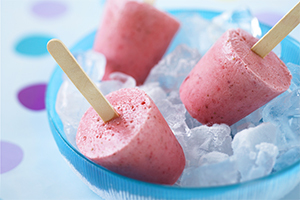 Children of all ages will enjoy these delicious, nutritious frozen treats. A hidden strawberry surprise awaits in each cup! Be sure to make plenty as these will magically disappear from your freezer. You'll need six 3 oz (90 mL) paper cups and six wooden stir sticks. In blender, combine strawberries, yogurt and honey; purée until smooth. Divide among six 3 oz (90 mL) paper cups. Onto each of 6 stir sticks, skewer strawberry half midway. Insert strawberry end of stick into centre of each cup. Freeze until firm, about 3 hours. Let stand at room temperature for a few minutes and peel off paper cups. Tip: To make it easy to store in the freezer, place filled cups in a muffin tin.